The Symphonic Jazz Orchestra (SJO) is comprised of Los Angeles’s finest studio musicians and jazz soloists. Over the years, such world-class soloists as Dave Grusin, Christian McBride, Raul Midón, Luciana Souza, Lee Ritenour, and Yellowjackets have joined the ensemble. The SJO has commissioned twelve new symphonic jazz works, along with six world premieres and three U.S. premieres. The phrase ‘symphonic jazz’ was coined by bandleader Paul Whiteman in 1924 following the wildly successful premiere of “Rhapsody in Blue,” a work he commissioned from a then little-known composer named George Gershwin. Fast forward to 2015, and the 67-member Symphonic Jazz Orchestra continues this important tradition through 14 years of commissioning new works and performing music that combines the worlds of jazz and classical. Their debut recording, Looking Forward, Looking Back, completes their historically focused mission originally conceived by founding Music Director Mitch Glickman and famed keyboardist/composer/producer George Duke. Founded by Glickman in 2002, the non-profit Symphonic Jazz Orchestra (SJO) was joined two years later by Duke as a co-music director, who helped to shape the orchestra over the next decade. Duke was featured in concert with the SJO throughout his involvement and was commissioned to write a new work for the orchestra featuring bassist Christian McBride. The work was premiered in 2011 and instantly, everyone knew this was a work that needed to be recorded. The following year, plans were underway to record Duke’s commission along with another newly commissioned work from guitarist and composer Lee Ritenour entitled “Symphonic Captain’s Journey.” The work that launched the symphonic jazz tradition “Rhapsody in Blue,” is also included on the recording with piano soloist Bill Cunliffe. In 2013, Duke captured the arc of the works they planned to record by naming the album Looking Forward, Looking Back; but as pre-production plans were underway, the recording project took on a new personal meaning after the premature passing of Duke. The recording opens with the work that inspired this project, Duke’s commission “Dark Wood: Bass Concerto for McBride.” The two-movement concerto features McBride playing on three different basses throughout the course of the piece (upright bass, electric bass and fretless electric). Duke wrote this extremely challenging piece as a showcase of McBride’s enormous talents. It includes notes that are not even on the bass (high Fs that McBride has to bend up to) as well as rhythmic passages that would scare off most bass players. On the recording, the rhythm section is rounded out by two incredibly supportive musicians, pianist John Beasley and drummer Marvin ‘Smitty’ Smith. The second commissioned work on the recording is Ritenour’s “Symphonic Captain’s Journey.” Based on an older work by Ritenour, this two-movement piece also features the talents of pianist Dave Grusin, drummer Chris Coleman, with McBride returning to play bass. The opening movement “Calm” is an apt description as Ritenour is featured in a long lyrical melody. The second movement “Storm” opens with a piano cadenza by Grusin that connects the two movements as the rhythmic intensity builds throughout the second half of the piece. interpretation both historic and progressive. The SJO version reinstates much of the piano improvisation that was lost as “Rhapsody in Blue” became popular and subsequently edited. 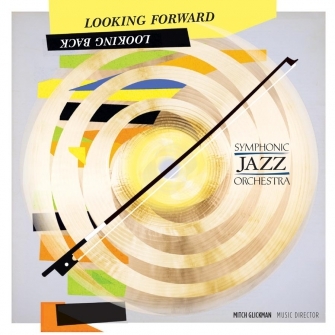 Looking Forward, Looking Back brilliantly captures the finest in new symphonic jazz works, while paying homage to its past. The forces of this special 67-member Symphonic Jazz Orchestra under the baton of Mitch Glickman bring to life works deserving of a wider audience as they continue to serve as the torchbearer of this unique genre of music.